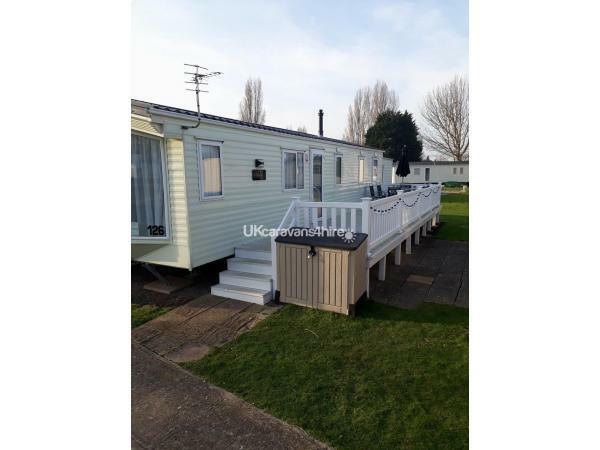 Our caravan is situated in Butlins Minehead in a quiet cove away from the main path of the caravan park. It is a modern and spacious caravan with a large living area which is light and airy due to the panoramic windows . It sleeps 8 with 1 double, 1 twin and 1 bunk bed and additional sleeping for 2 via a sofa bed . The caravan has a shower room with toilet and a separate 2nd toilet. There is a 32 inch TV in the lounge and a fully equipped kitchen. Also available is a travel cot with mattress , high chair, iron and ironing board and hair dryer and plastic cutlery and plates etc for children. The decking spans the entire side of the caravan and has patio furniture that sits 6 . Also solar lights surround the decking which switch on in the evening . Entertainment passes are included in the price, along with gas and electric. With the exception of live music weekends ( adult only weekends) and special events. Duvets and pillows are provided but you will need to bring your own linen. One parking space is available in front of the caravan, with additional spaces in the main car park. This is a lovely caravan with a real warm and homely feel to it. Leanne is incredibly helpful and quick to respond to emails making the booking process easy and stress free. We stayed with our 7 and 3 year old and the caravan was perfect for us and in a nice quiet location. A great place to unwind after a busy day at Butlins. Thank you. From first call with Leanne, she was nothing but helpful. We had ran out of options for August break and thought we wouldn’t end up going away. Spoke to Leanne and immediately had the break! Her caravan is beautiful! Very well presented, very cosy and immaculate. Highly reccomend her. So lovely and has great customer service. Would love and hope to stay with her again! From the first email enquiry to final booking and payment was a quick response and friendly. We were kept up to date with booking details and confirmation.The caravan was very clean and felt very homely and modern. 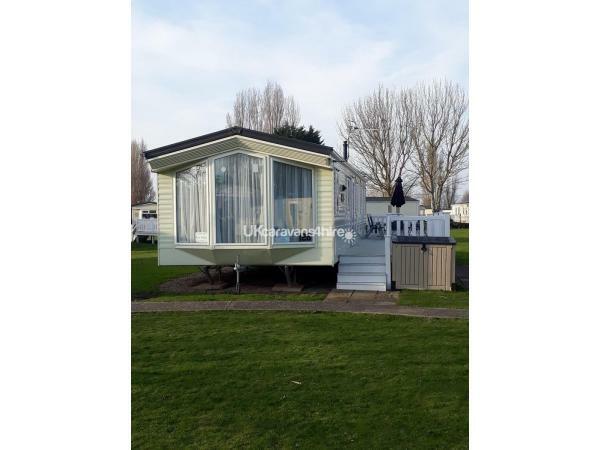 It was well equipped and child friendly.The caravan's location is ideal for the children as there is a grassy area next to it that they can play on and away from the main path. The veranda was very useful and pleasent to sit out and relax on. It does not take to long to get to the dome you just keep following the path down. Would defientley book again next time we plan a holiday. Thank you Leanne and good luck. Start to finish was pleasant and easy. Emails were answered within 1 hour or less (each time). Was kept updated. 1st time in caravan at Butlins and owners 1st time renting and we loved it. Very clean homely caravan fully equipped and child friendly, all items are new (most still got tags on ). Leanne (owner) has been very helpful start to finish. Caravan is situated in ideal location with flat area outside ideal for kids to play. Approx 10 min walk to the dome. (Will deffinatley book again next time we plan a visit) Good luck Leanne and thank you.